I plan to blog more this year. It's not a New Year's Resolution, just a plan I'd like to implement. Even if the posts are short, I'd like to get back to regular posting. Stay tuned to see if I succeed. I plan to: blog more, knit more, and spin more. YES I said SPIN. More on that...later. She loves the socks and has been wearing them night and day with a liner of cotton socks. I knit them with handspun sock yarn that I bought from KnittinPretty at etsy. The mitts are knit with handspun from Hobbledehoy at etsy. I have a serious addiction to Hobbledehoy's yarn, and I think it is the main reason for my desire to spin my own yarn (so I don't go broke at Hobbledehoy). In the long run, the wheel is cheaper. I was able to knit three pair of these mitts from the one skein, so I kept a pair, sold a pair, and gifted a pair to my niece for Christmas. This was supposed to be my cozy Christmas sweater. 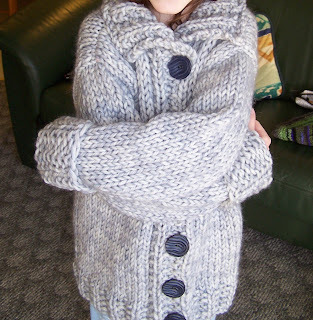 I knit it with Rowan Big Wool Fusion in a smoky blue/grey colour. I used the Rowan Pattern from Big it Up. The sweater was fun to knit, and quick on 12.75mm needles. And it doesn't really fit me, so it went to Little Miss H (who just turned 11). She loves it and calls it her "sleepover sweater." I wasn't allowed to show her hair 'cuz she was mad at it, and I'm supposed to say that this is her stunt-double posing in the sweater. This is the yarn I used to knit my nephew a pair of socks for Christmas. Yeah, I know, lame to show the yarn and not the socks. Didn't get a photo. Yeah, I know. Lame. Especially as I have more of the yarn available in my shop, and you'd think that pix of nice socks knit in it would be a great marketing tool. Yeah, I know. The yarn is called Rusty Camo, and it was fun to knit for socks on size 4.0mm (cuffs) and 3.75mm needles (the rest). I used about 150 grams to knit size-10 men's socks with 10 inch legs. The socks knit up fast, and the yarn striped in chunky stripes of rust and green. They looked great. I also can't show you the two monster hats that I knit for my other two nephews. They were grand, and so quick and easy to knit. The monster patches just pop right out. The nephews loved them and wore them all through our time at dinner and after. Do you think I got any photos?? Yeah, I know.